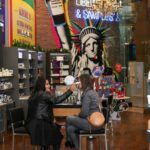 It wasn’t long ago that my friend Catherine asked me to break down the best makeup for busy moms. And right before she came back from maternity leave, she specifically pegged me on eye cream recommendations. I’m no expert on mom beauty shortcuts yet, but I know eye cream. I started using it when I was around 19 (Clinique All About Eyes, a beginner’s staple!) and I’m a firm believer that it needs to be a part of every woman’s routine. It’s never too early or late to add that step, and the payoff is major. 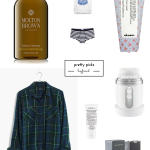 I’ve put together a list of my top recommendations, in low to luxe fashion. I like options, and I imagine you do as well! Acure Organics Eye Cream is one of the best values I’ve come across — especially considering the organic, superfruit-packed formula (Acai! Pomegranate! Goji berry!) It’s lightweight but don’t worry, it’s fighting the good fight against wrinkles. One of my favorite things about this brand is that for every product sold, they donate $1 to Bright Pink to help fund breast cancer education. I went through a major Origins GinZing phase a few years back and it remains a favorite. It’s like a cup of coffee for your eyes, with a blend of caffeine, ginseng and optic brighteners to bring visible radiance to the eye area. I like to blend my concealer with a dab of this and apply together. It’s a good morning boost. 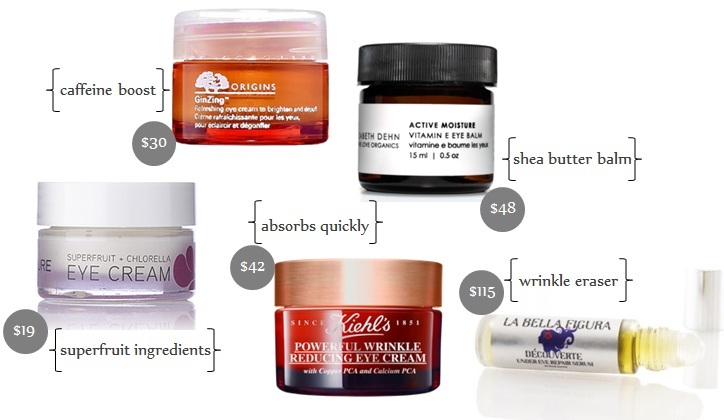 I am a fan of most of Kiehl’s eye creams, and I really like the new Powerful Wrinkle Reducing Cream. It uses Copper PCA (an essential mineral in the skin) to prevent the breakdown of collagen. I love how quickly skin drinks it up (making it very easy to wear during the day) and the formula has a solid blend of wrinkle-fighters and moisturizers. My new obsession is the shea-packed vitamin e eye balm from Elizabeth Dehn for One Love Organics. Shea butter is everything! The value in this tiny tub is crazy, given how little you need. It’s daytime appropriate, but best suited for night when you can layer it on for some good old fashioned beauty sleep. Elizabeth advised me to dab some on my lips and cuticles. I did so with the leftover on my finger after applying undereyes —- there’s never any waste! I’ve saved the luxe for last! 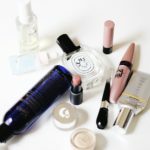 And it’s not even an eye cream but an oil serum – La Bella Figura Découverte Eye Repair Serum. I like to call it my magic eraser. If you are looking to really combat the crow’s feet, you need to call in the big guns. Découverte is made from pure barbary fig seed oil and it’s extremely effective in making stressed tissue appear smooth and youthful. I don’t throw around the “miracle” word like ever but I think this can actually help reverse signs of aging. It’s a worthy investment and the good news is a little bit goes a long way. 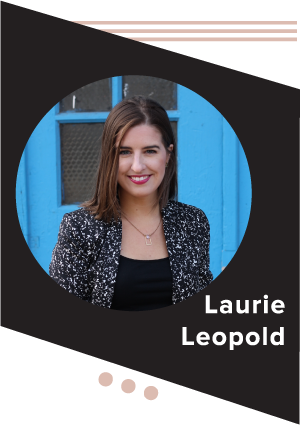 Thank you so much for this post, Laurie! 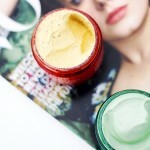 The EDOLO balm has been firmly placed on my wish list and I’m very intrigued by the La Bella Figura! 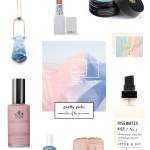 The Vitamin E balm is spectacular — there’s a 20% off code going on now (info is on Beauty Bets!) and I think the sample packs (less than $4) are a great way to try the line. The tiniest bit of balm goes a long way. All that goodness shea butter. Yum.